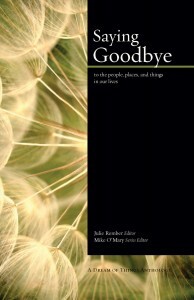 Today is the release date for the anthology Saying Goodbye. I have an essay in it called “Holding Him Softly”–it’s about handing my son over to the adoption agency when I was 17 and he was was just a few days old. The book is a satisfying mix of essays that are sad and funny. It would be a great gift for someone who is moving, retiring, graduating, grieving–saying goodbye to people, places, or things. This entry was posted in Dream of Things Publications, getting published, Saying Goodbye on October 11, 2010 by declemen.